ScreenSteps Desktop 2.9 and Workgroup DocumentationScreenSteps Desktop & WorkgroupScreenSteps 2.9 Editing StepsHow do I Search for Text in a Lesson? Select Edit > Find > Find.. 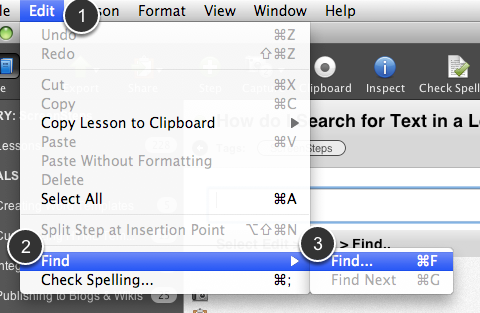 When editing a lesson the Edit > Find > Find... menu item will bring up a find dialog. The Find in Lesson dialog provides a simple means of finding occurrences of a string in your lesson. Enter the string and click the Find button. The next occurrence of the string will be highlighted in your lesson. To quickly find the next occurrence of the string you can press Command + G on OS X or Control + G on Windows. Alternatively you can select the Edit > Find > Find Next menu item. Prev: How do I Check Spelling? Next: What is Lesson Status?